Meyer Turku Shipyard has celebrated the float out of the first ship being contracted and built totally under the ownership of the Meyer family of Germany. 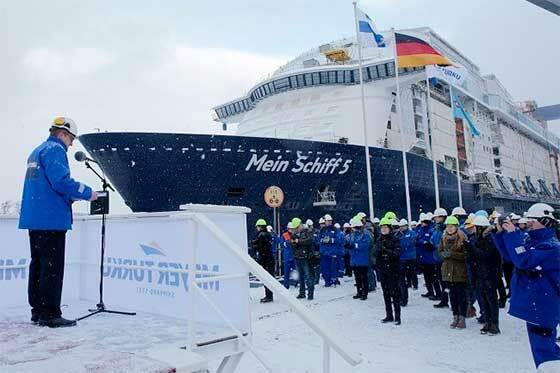 Mein Schiff 5 was floated out of the dry-dock during a snowy ceremony last Friday, January 15.Mein Schiff 5 is a sister ship of Mein Schiff 4, which was handed over to its owner TUI Cruises last spring. The float-out and transfer of the vessel from the dry dock to the outfitting pier marks a shift from the construction phase of the ship hull to the outfitting phase. Ferdinand Strohmeyer, Vice President Operations of TUI Cruises and Jan Meyer, CEO of Meyer Turku, were among the people participating in the opening of the dry dock valves. “Step by step the good work of our team is coming together and the ship starts to look like a ship. Mein Schiff 4, the sister ship is well received by its guest – yet we cannot stand still and are implementing multiple improvements, big and small, on Mein Schiff 5 to further improve the guest experience. I’m confident that, once again, we will be able to deliver TUI Cruises a wonderful new cruise ship on time,” said Jan Meyer. TUI Cruises has expressed its satisfaction with how the work has progressed and with its continued good cooperation with Meyer Turku. “Although this is meanwhile TUI Cruises’ third new build, it is still a long way from becoming routine. It’s always a great feeling the first time we see the ship afloat,” said Ferdinand Strohmeier. TUI Cruises ordered the Mein Schiff 5 in September 2014 as Meyer Werft finalized its purchase of the Turku Shipyard (then named STX Finland Oy) from STX Europe. The shipyard was then renamed Meyer Turku Oy. The order for the new ship was placed along with an order for Mein Schiff 6 as options to TUI Cruises’ contract for Mein Schiff 3 and Mein Schiff 4 with STX Finland. Meyer Werft originally acquired the Turku Shipyard together with the Finnish Government who agreed to a 30% stake. Meyer Werft later became 100% owner in Meyer Turku Oy in April 2015. When completed, the Mein Schiff 5 will be 295 meters long and 36 meters wide, with special attention paid to energy efficiency in its design and construction. The cruise ship will have 1,267 cabins, of which approximately 90 percent will be outer cabins and 82 percent will have their own balcony. The ship will also accommodate about 1,000 crew members. Delivery of Mein Schiff 5 is expected in the summer of 2016. TUI Cruises has since also returned to Meyer Turku for Mein Schiff 7 and Mein Schiff 8. The ships are scheduled for delivery in 2018 and 2019, respectively. Under its new ownership, Meyer Turku Oy has also secured an order for two ships from Carnival Corporation, as well as a LNG-powered fast ferry for AS Tallink Grupp.